As I suggested yesterday when I previewed Deadly Class, 80s nostalgia has entered a new phase and is now finally contemplating the downside of the 80s, not just its terrible hairstyles and great music. Unfortunately, Deadly Class turned out to be a pretty weak affair, written as if by someone who’d read about the 80s in a Wikipedia article, rather than by someone who’d actually been there. It didn’t feel like anyone involved really had a firsthand, good idea of what was bad about the 80s. 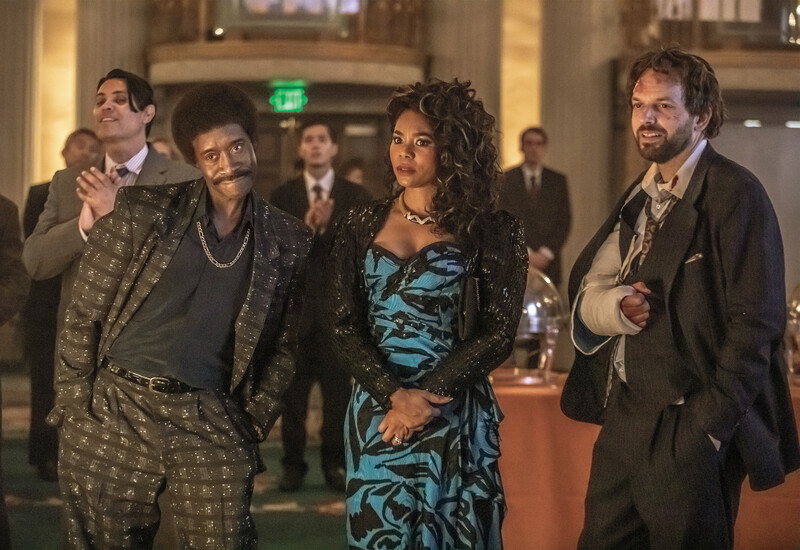 Now, Black Monday isn’t any more successful at recreating the 80s than Deadly Class is. Set on Wall Street a year before one of the most terrible moments of the 80s and purporting to reveal the true cause of that eponymous stock market crash, there’s never a moment when you think you’re watching a documentary, as you often did in The Americans, or a movie or TV show of the time, as you often do with Stranger Things. Not even deploying the old Showtime titles helps there. Subways are too graffiti-covered, hairstyles are too stupid, clothes are too loud or too brown, cars are too ridiculous. It’s Wolf of Wall Street made by someone whose only idea of the 80s comes from having watched Wolf of Wall Street. But that misses the point. Black Monday has a get-out card that Deadly Class doesn’t. It’s a comedy. 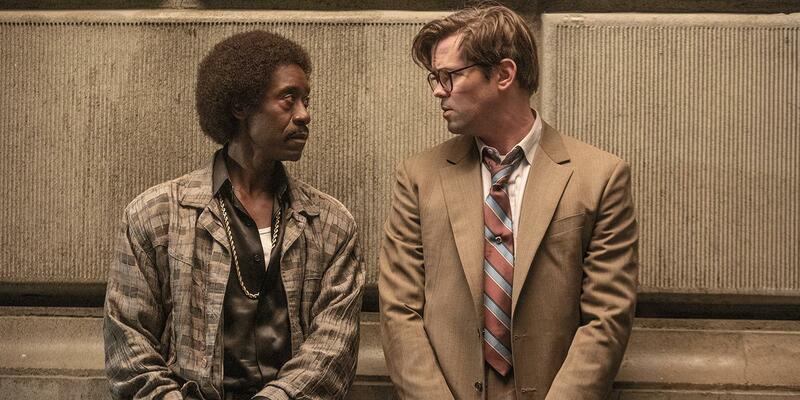 The star of the piece, fresh from modern day financial skullduggery in Showtime’s own House of Lies, is Don Cheadle playing Maurice Monroe, the owner of the 11th most powerful brokerage on Wall Street in 1986. A self-made man who pulled himself up from dirty poverty, Cheadle has his eye on acquiring a company called Georgina’s Jeans, which makes its trousers in Manhattan and whose land is therefore worth twice what the company itself is worth. Soon, he’s putting the wheels in motion to try to acquire it. Meanwhile, Andrew Rannells (Girls, The New Normal)’ marvellously named Blair Pfaff is the new kid on the street. A recent MBA graduate whom all the brokerages want because of his computer modelling skills, the world looks like it’s his oyster until he (literally) bumps into Monroe, who on the spot decides to destroy Rannells’ life. Soon, they will clash again – but how will it end? To some extent, we know the answer to that question, since we start with a flashforward to Black Monday itself when the fates of the two characters are seemingly revealed. We also know in a different way, because there’s a twist to the main plot of the first episode that you’ll probably see a mile off. But Black Monday‘s real skills aren’t in the plotting so much as the general mockery of the 80s. There’s a slight air of Trading Places to proceedings and the show also acts as a slight precursor to yet another Showtime finance show, Billions, but the show’s best when it’s sending up Wall Street’s excesses of the time, and those of the decade itself. You get all the trash talking, the cocaine-addled aggression, the nerdy white privilege, the raw power, the stupid gadgets and more. Brilliant. 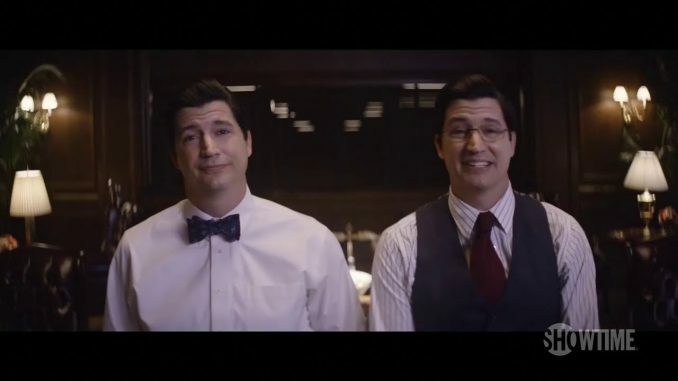 Nevertheless, despite some good individual moments and a cast that also includes the likes of Ken Marino (Party Down, Marry Me) and Casey Wilson (Happy Endings, Marry Me), there isn’t a huge number of laughs to be had. 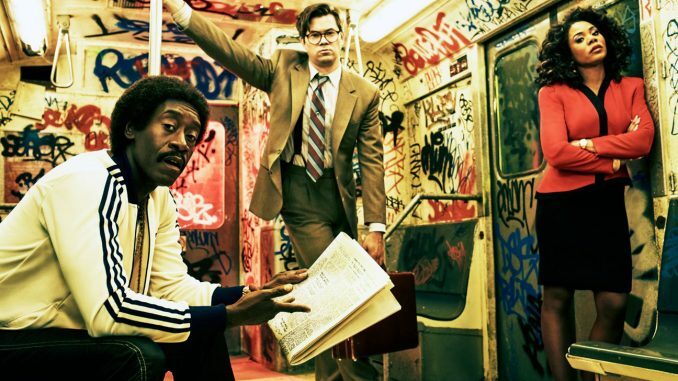 Cheadle gets a good line in dialogue, but comes across like a toned down Don Simpson at worst, rather than a Donald Trump or Gordon Gecko; Rannells is a little too camp to be the unhoned Wall Street type the script demands of him; and Hall is mostly there to force Cheadle to mourn over his empty life, rather than have any real animus or anima or her own. It’s all just a little bit too weak and unfocused to really make it as satire. But if you just fancy looking at the 80s and laughing at them, and you’ve already seen Trading Places too many times, Black Monday‘s a decent enough way to spend a half hour.